Canada's GDP growth is forecast to slow down to about 2% in 2018, due to a slowdown in private consumption and government spending. 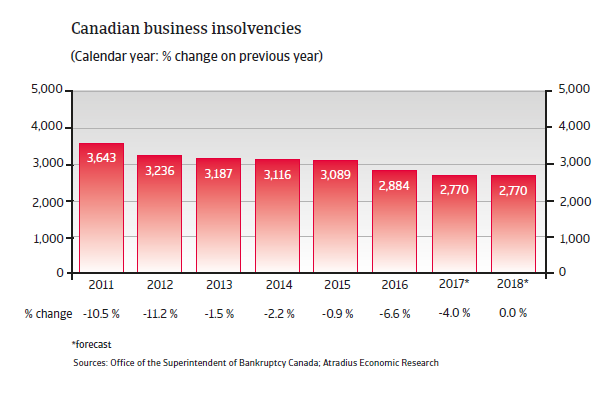 The pace of insolvency decline slowed down in 2017. 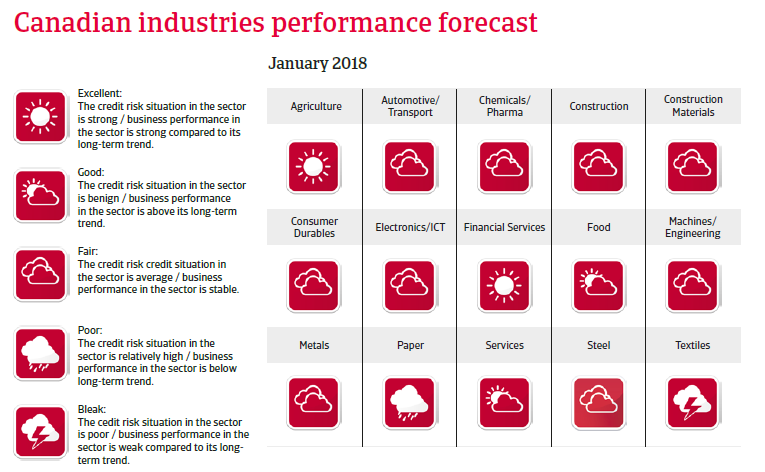 No further decrease expected in 2018. 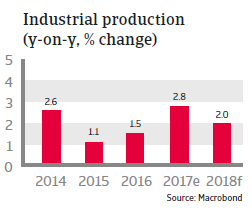 Mainly due to decreased oil prices, Canada´s GDP growth slowed down to below 2% in 2015 and 2016 as investment in mining, quarrying, oil and gas extraction contracted. 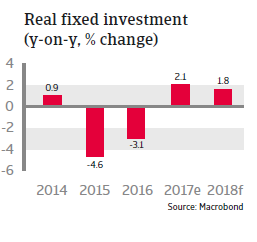 However the economy rebounded in 2017 growing 3%, mainly due to robust household consumption growth, a recovery in investments (especially in the energy sector) and increased exports. 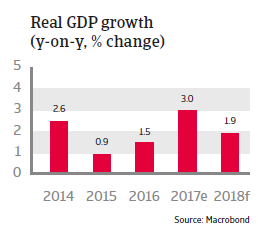 The economic expansion has eased somewhat in H2 of 2017, and GDP growth is forecast to slow down to about 2% in 2018, due to a slowdown in private consumption and government spending. After growing 2.3% in 2016, private consumption growth accelerated to 3.7% in 2017, underpinned by continued solid employment and income growth (wage growth and house price appreciation). In 2018 household consumption growth is expected to decrease somewhat due to lower wage growth and additional interest rate increases, but to remain above 2% year-on-year. Inflation is expected to increase modestly in 2018, but to remain below 2%. Household debt expanded in recent years, with most consumer borrowing going into buying homes, as property values have gone up and interest rates are low. However, it is estimated that housing is currently overvalued, and household indebtedness (mainly mortgages) has increased to almost 170% of post-tax income, while the ratio of household debt to GDP has risen above 100%. Any potential economic downturn (especially rising unemployment) could turn the consumer debt issue into a real problem, even threatening the stability of the financial sector. Recently changes in tax and housing finance policies and two moderate increases of the benchmark overnight lending rate by the Central Bank since July 2017 (up to 1%) have helped to cool down the property market somewhat. 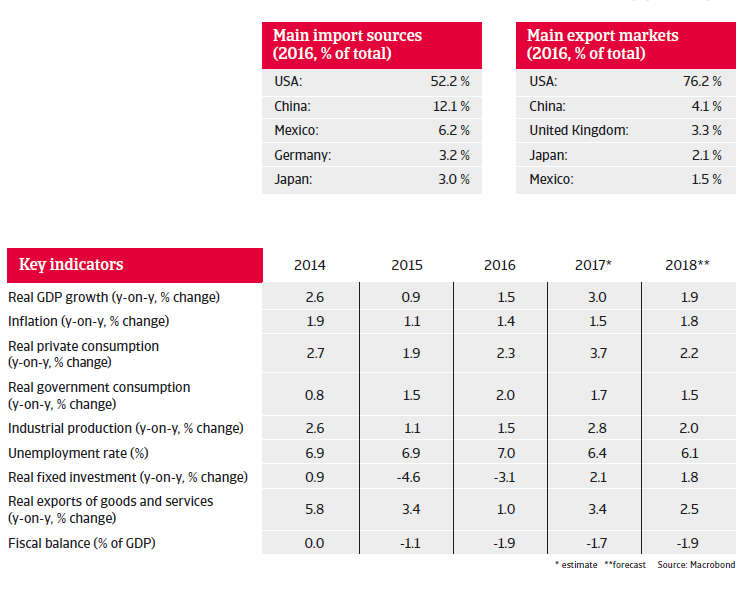 The short-term economic outlook could be negatively affected by an adverse outcome of the ongoing NAFTA renegotiations and/or an escalation of ongoing trade disputes with the US (Canada´s Southern neighbour accounts for more than 75% of its exports), leading to increases in specific trade barriers. US President Trump has repeatedly complained about the US trade deficit with Canada, and Washington is set to maintain additional tariffs on certain Canadian lumber exports, while it has already imposed a 300% import tax on a certain jet plane made by Canadian aerospace firm Bombardier over allegations of below-cost selling by a major US competitor.